Families traveling together often find that a suite is their best option for a comfortable vacation. 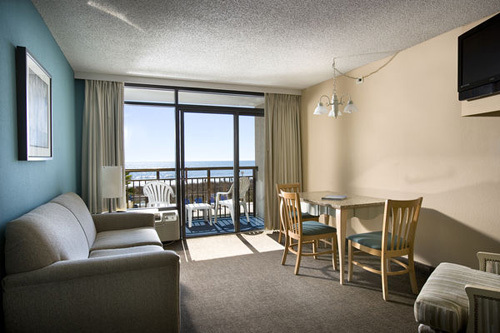 Our resort offers a variety of suites in Myrtle Beach including the Double Suite, which comes in both oceanfront (pictured left) and ocean view. While the layout of the Ocean View Double Suite is slightly different than the layout of the Oceanfront Double Suite, both suites come with the necessities you will need for your family vacation. Each has a bedroom complete with two beds and a TV, along with a separate living room which includes a double Murphy bed and a flat screen TV. Many families choose to utilize the living room as extra sleeping space for the kids as it can easily be transformed back to a living room during the day. Additional suite amenities include a private balcony, table with four chairs, a bathroom, full kitchen with refrigerator, microwave, stove and toaster, free Wi-Fi, daily housekeeping, linens and bath towels. These suites are located on floors two through 15 and can sleep up to six people (with no more than four adults). Want to explore other room types here at Captain’s Quarters Resort? Click here to view our entire lineup of rooms, efficiencies and suites or give us a call today to speak with one of our friendly reservation agents to start planning your Myrtle Beach family vacation!